News Article - ResponderSafety.Com Awarded Grant to Launch New Learning Network! ResponderSafety.Com Awarded Grant to Launch New Learning Network! 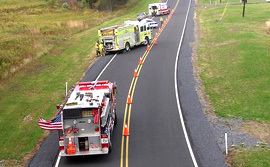 The Cumberland Valley Volunteer Firemen’s Association is pleased to announce that it has been awarded a USFA/FEMA Fire Prevention & Safety (FP&S) Grant to launch this learning network dedicated to safety best practices in traffic incident response and management. This new training network is hosted and was built by Stonehouse Media Incorporated®, based on the phenomenally successful CFITrainer.Net® platform. The network will be free to all responders involved in traffic incident management. The new learning network will deliver video and interactive modules on best practices and live webinars about breaking developments. These training pieces will be easily accessed via desktop computer, laptop or mobile device. The network will also have downloadable resources, polling, a testing platform, and tracking and reporting of program completion for each user. In the future, the network plans to have its content approved for Continuing Education Credits from many different state and other agencies.